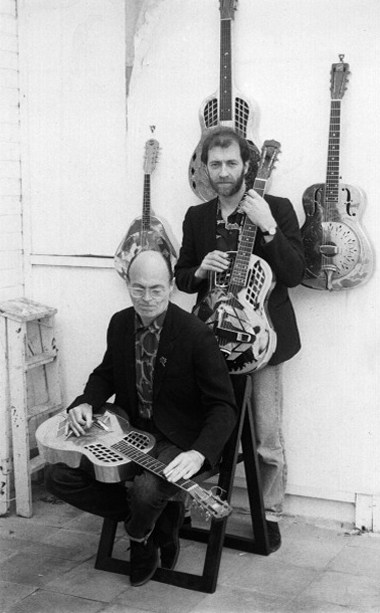 In 1987 National Gallery was formed out of a mutual love of National Resonator guitars and Hawaiian and Acoustic Blues by Mike Cooper, Mark Makin, Ed Genis and Mike Messer. 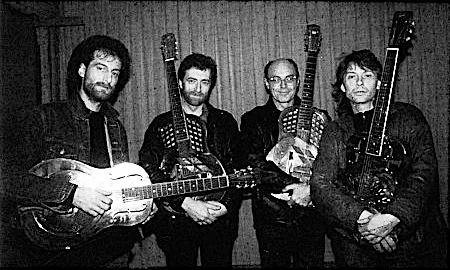 This original lineup toured Italy a couple of times and did a few gigs around the Reading area; did some radio but never released any recordings. There are live recordings and a couple of videos in circulation. 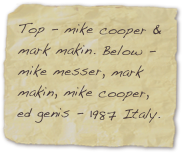 We were rather overshadowed by the formation (shortly after we formed) by The Notting Hillbillies – which included in its line up Mark Knopfler from Dire Straits – an unfair advantage you have to admit. When the original National Gallery broke up Mark Makin and I continued as a duo and when it came time to record we called in the assistance of singer Viv Corringham and saxophonist Lol Coxhill. We released one c.d. – ‘Keep It Clean’ on Rhiannon in 1997. As well as being a great guitarist Mark is also famous for his 1966 photographs of Bob Dylan’s concert at the Manchester Free Trade hall – the famous ‘judas’ concert. As National Gallery Mark and I toured the former East Germany in the weeks leading up to its final collapse in 1989, together with the East German group Jonathan Blues Band and Angelika Weiss.